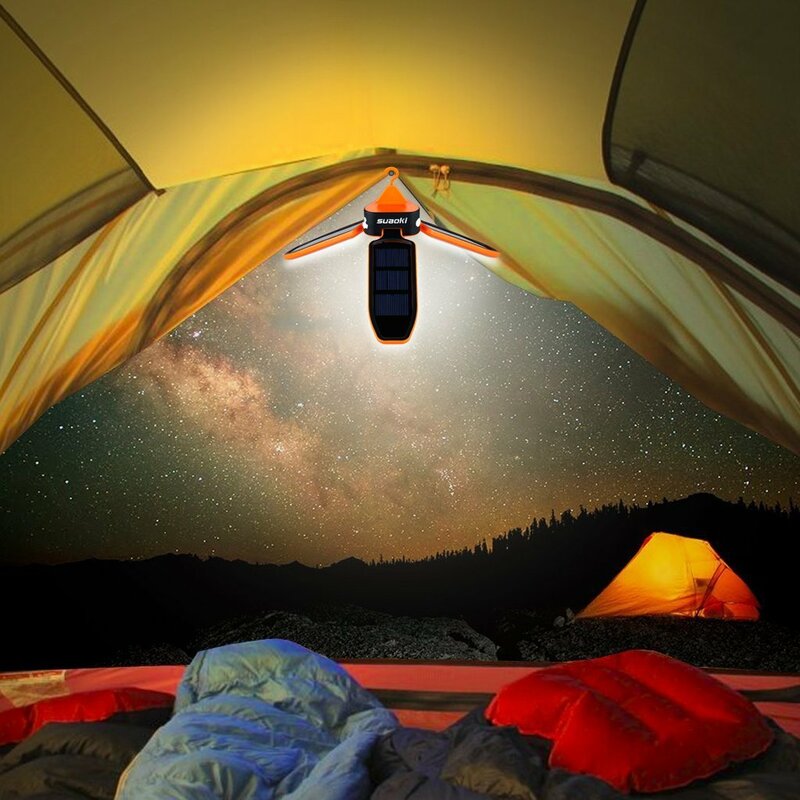 The Suaoki Collapsible Clover Style LED Solar & USB Tent Lantern. The Therm-A-Rest Z Lite Sol. Image Credit: Hiking Mastery. An oddly unproblematic category for people with mold-related illness is that of camping sleeping pads. While standard-sized air mattresses often are quite toxic due to the plastics involved, many self-inflating mattresses and closed-cell mattresses (which are not required to contain fire retardants) tend to be pretty tolerable for even quite sensitive people right out of the box. The vast majority of the reports that I have gotten from mold avoiders about Therm-A-Rest mattresses have been especially positive. REI Co-op’s house brand generally gets good reports too, and I have heard a number of individuals say positive things about Wiggy’s pads as well. The mattress that I slept on comfortably for many years when tent camping was the Therm-A-Rest BaseCamp. It is a 2″ mat that rolls up nicely and works well on the ground. For sleeping inside my RV, I purchased the Therm-A-Rest DreamTime, which was somewhat like a bed in terms of its comfort level. It was not a cheap mattress ($200), but I did really enjoy sleeping on it. It had some foam in it, but nonetheless felt okay to me from the start. On the other end of the price spectrum, the Therm-A-Rest RidgeRest SOLite is an inexpensive silver-colored mattress that reflects body heat and therefore serves to add extra warmth in cold temperatures. Many people also use the this mattress as a pad when sitting on the ground. The Therm-A Rest RidgeRest SOLite is reported to be well-liked in the environmental illness community because it is especially low in problematic chemicals. The Therm-A-Rest Z Lite SOL is similar, but a little lighter (and more expensive) for backpacking use. For camping in cold weather, I also might be interested in the Nemo Astro Insulated Lite, which includes some Primaloft insulation and has gotten some good reviews. 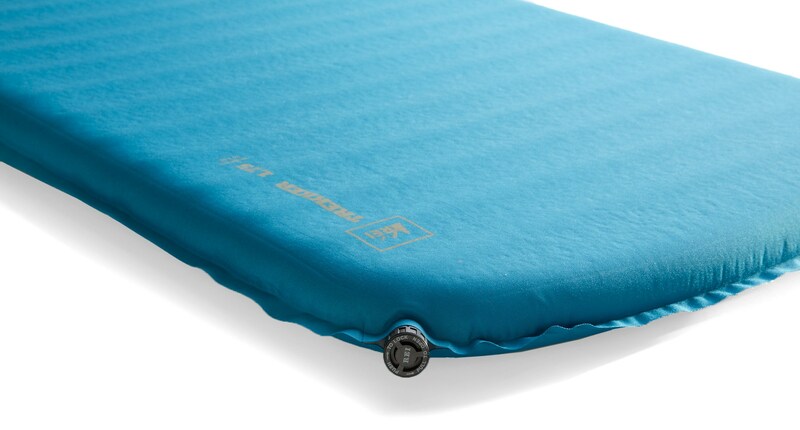 I’m guessing that this mat will work equally well with my Coleman ComfortSmart Cot, but I want to give it a try in the store before I actually purchase it. 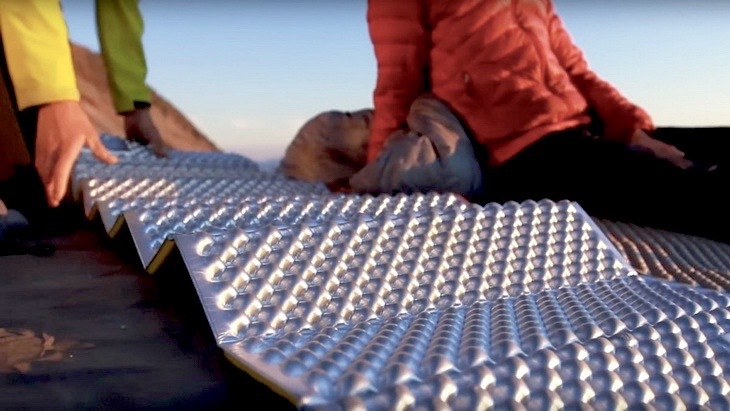 The REI Trekker Self-Inflating Mattress. I have listed below a few other self-inflating mattresses that have gotten positive comments from other mold avoiders as well. For those who prefer an air mattress, the Lightspeed Outdoors is the one that seems to consistently get the best reviews among those in the environmental illness community. Finally, a yoga mat can provide some extra cushioning underneath a self-inflating mattress or can be used on its own in emergencies. I have slept on one reasonably comfortably for a few nights when loaning my self-inflating mattress to a guest, for instance. *Therm-A-Rest Z Lite Sol. $35-45. *REI Co-op Trekker Self-Inflating Sleeping Pad (Women’s). $70. REI Co-op Trekker Self-Inflating Sleeping Pad (Unisex). $70-80. Nemo Astro Insulated Lite. $120-150. More REI Co-op Mattresses. $70-139. Gaiam Premium Print Yoga Mat. $30. Lightspeed Outdoors PVC-Free Air Mattress. $75. Especially when the weather at night is cool or cold, sleeping bags can be useful at retaining body heat and allowing the user to remain relatively warm. They also can provide a fairly self-contained space for the user, and they can be light and compact in a backpack. That being said, especially for people who are just starting out with mold avoidance, sleeping bags can have a number of downsides. They often are constricting, which can be a problem especially for those who suffer from body pain or sleep difficulties. They are not really intended to be washed very often and can be a real challenge to decontaminate. In some cases, they may arrive contaminated with fire retardants or waterproofing chemicals that cause reactions. And they tend to be expensive. Those who are going camping for the first time therefore may want to put some thought into whether they want to get a sleeping bag at all. It’s quite possible that a more conventional bedding system using sheets and blankets may turn out to be a better choice. Even if people opt against using a sleeping bag though, choosing different kinds of materials for sheets and blankets (as well as for clothing) than they typically might use at home might be worth considering. In particular, with some exceptions, cotton very often tends not to be a great material for hiking or camping since it dries slowly if it becomes wet, gets dirty easily, and is relatively heavy. Materials such as fleece, microfibers, nylon, wool and silk may be better choices for camping use. If sleeping bags are used, making a particular effort to protect them from contamination (including environmental cross-contamination as well as sweat) likely will be very important. Some strategies for this may include wearing head-to-toe clothing when in the sleeping bag; using a sleeping bag liner; being careful to decontaminate when necessary before coming into contact with the sleeping bag; protecting the bag when traveling by storing it in a case or plastic bin; and avoiding using the bag at all if locations seem suspect with regard to toxicity issues. I am in general not a very big fan of most synthetic insulation, due to breathability problems. Although there are some newer insulations (such as Polartec Alpha) which do breathe quite well, I have not seen yet seen them used in sleeping bags. More standard synthetic insulation, such as Thinsulate, hardly seems to breathe at all, and this can very easily result in sweating or overheating when in a sleeping bag. The REI Siesta Sleeping Bag. Image Credit: The Wirecutter. Still, when temperatures are cold, the heat retention provided by synthetic insulations can be very welcome. Although down (which is somewhat more breathable) also can provide that warmth, down tends to be much more expensive for an otherwise comparable bag. In addition, when we are talking about the sort of roomy and non-constricting sleeping bags that may be most appropriate for individuals with chronic illness, synthetics tend to be the only choices available (presumably because creating a warm and roomy sleeping bag from down would be prohibitively expensive). In addition to being roomy enough to be comfortable and being non-toxic, I tend to think that a sleeping bag that would be appropriate for our purposes would be adaptable in whatever ways to a range of temperatures. In addition, I would like for the sleeping bag to be fairly easily washable (since it might become cross-contaminated from environmental mishaps or from sweat); relatively compact (so as not to take up too much room in the vehicle); and reasonably inexpensive. While sleeping bag bulkiness does seem relevant, weight seems much less so if we are assuming that the bag is going to be used only in the van or at the campsite rather than taken on a backpacking trip. An L.L. Bean Camp Sleeping Bag. Those who are uncertain whether they want to sleep in a sleeping bag at all may consider the L.L. 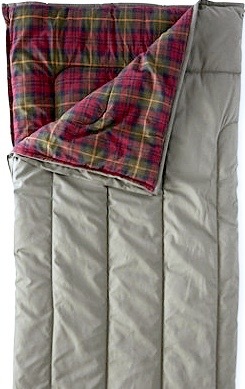 Bean Camp Sleeping Bag, which is a heavy and roomy, rectangular, flannel-lined bag that unzips into a quilt. This was the first bag that I bought when I started camping, and I did well with it for many years. Based on my own experiences and on the reports that I have gotten from other mold avoiders, the L.L. Bean Camp Bag seems to be one of the least toxic bags out there. It also is reasonably priced. The main disadvantage of the L.L. Bean bag is that it is bulky and likely will not fit in a conventional top-loading washing machine. Although it may be washed by hand at the campsite (I did that at least a couple of times), it may take quite a while to dry even in the desert. I therefore suggest making a particular effort to keep this bag clean. Although I had the 20 degree cotton-lined version of the L.L. Bean bag, the 40 degree version that is lined with a cotton-synthetic blend is said to dry faster and therefore may be easier to wash. The cotton blend version of the bag also is a little less expensive and is available in a variety of patterns rather than just solid colors. Some popular children’s versions of the L.L. Bean bag also are available. The REI Siesta 30 Sleeping Bag is a 30-degree bag that is quite similar to the L.L. Bean Camp bag, except that it does not have a flannel lining. The other main difference is that it has a short zipper on the folded side, allowing the front section of the bag to be folded down if things start to feel too hot. I thought that it felt pretty good to me from a toxicity standpoint when I tried it at the REI store. The Sierra Designs Frontcountry Bed is another roomy and non-constricting bag with synthetic insulation. The 35-degree bag attaches to a sleeping pad so that it will remain in place while the user rolls around inside. Interestingly, it has no zippers or other fasteners. The Sierra Designs Down/Synthetic Frontcountry Bed. The Frontcountry Bed is available in regular and long lengths; in addition, there is a Duo version that may be appropriate for a couple, a parent sleeping with a child, or a single individual who is larger or wants an especially large amount of room. All the bags are designed for temperatures down to 35F. Although I have not had a chance to see the current version of the Frontcountry Bed, I do own a discontinued version of it called the Sierra Designs Down/Synthetic Frontcountry Bed. The version with the mixed insulation (which is green rather than blue) is still available through many retailers online. I paid less than $140 for mine a few months ago, through Amazon Prime. This bag is somewhat larger and heavier than most bags that are designed for backpacking, but it still is fairly compact even when just stored loosely in a bag rather than super-compressed. Unlike certain other roomy sleeping bags that I considered, it felt okay to me right out of the box. I especially like the fact that I can slip a full-sized pillow into the hood of the bag. Being able to easily push off the down “top sheet” or to stick my feet out the hole in the bottom of the bag if I get too hot in the middle of the night also is appealing to me. The Frontcountry Bed is a mid-range bag with regard to temperatures. I would guess that if I am wearing appropriate clothing (e.g. stretchy pants, shirt or fleece top, maybe long merino-wool underwear, maybe a down vest), it will work for me on its own in temperatures between maybe 40F to 65F. If the weather gets colder, I might add a fleece sleeping bag liner. (It’s a little awkward to get settled with a fleece liner in this bag, but very comfortable once everything is in place.) I also could add a wool blanket or a sleeping bag quilt over the top. Or I could stuff a down quilt or other blanket inside the bag to provide more insulation, since there is plenty of room in there even when a liner is being used. On the other hand, if the weather gets warmer, I might lie on the top of the Backcountry Bed (maybe with my pillow still anchored in the hood to protect it), since it makes a pretty comfortable sleeping surface. Hopefully, the fact that the previous version of the Frontcountry Bed feels good to me means that the current version – as well as other sleeping bags from Sierra Designs – will be good from a toxicity standpoint too. I would like to hear some reports. I also recently tried out the L.L. Bean 3-in-1 Burrito sleeping bag. This is a 40-degree bag with a zipper, with its own fleece liner to add warmth when the weather gets cooler. The main bag feels good to me from a toxicity standpoint, and the liner (which seems slightly iffy to me) should be fine after a wash. The L.L. Bean 3-in-1 Burrito Sleeping Bag. The L.L. 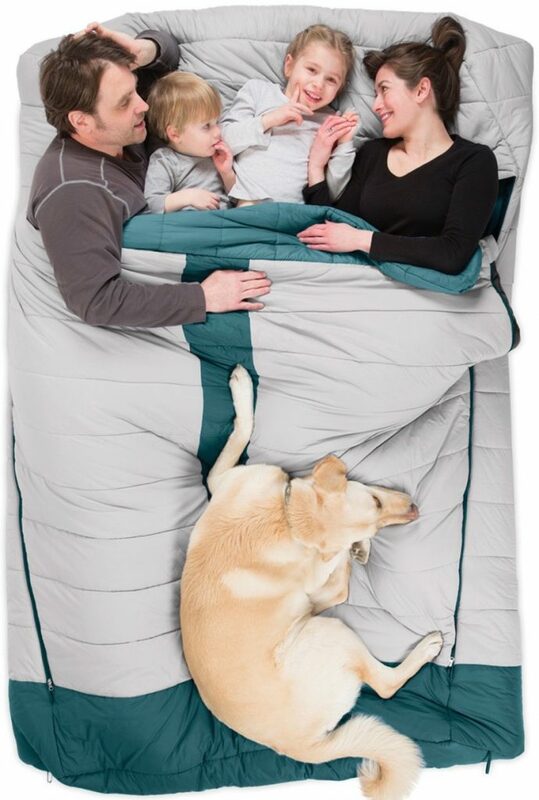 Bean 3-in-1 Burrito is similar to the Sierra Designs Frontcountry Bed in a number of ways – for instance, in its roominess, in its ability to attach to a sleeping pad so that it remains in place as the user moves around inside it, and in its ability to hold a standard bed pillow in the hood. In short, both of these bags provide the user with a comfortable, self-contained sleeping experience that might be particularly desirable when, say, sleeping in hotels on iffy bed linens. The main problem that I have with the L.L. Bean Burrito bag is that it is just too big for me. The bag is only available in one length and seems that it would easily accommodate someone who is 6’6″ or taller, while I am only 5’3″. Because the bag is so large and bulky, and because of the the included sleeping bag liner, the duffle bag holding the whole package is quite large and would take up quite a bit of room in the van. The Sierra Designs Frontcountry Bed folds away much more compactly, even though it feels just as comfortable when I am lying inside it. I also am not sure if I would want to sleep inside a bag that was 100% synthetic unless it was really cold outside. And although the Burrito bag unzips into a quilt, the integrated hood in the top part results in that quilt not being one that I am sure that I would be inclined to use very often. One really positive feature of the L.L. Bean Burrito is that the care instructions do not state that it needs to be washed in a commercial front-loading washer. It seems that the outside of the main bag is made of durable enough material that it can survive the agitator of a conventional machine. Moreover, the outer bag fits (barely) inside my own apartment-sized washing machine, and so I think it should be fine (even with soap) in a regular-sized top loader. I very well may hang onto this bag just because it seems like it will be comparatively easy to keep clean, therefore. 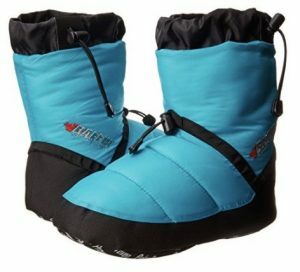 On my recent trip to REI, I had a chance to try out the Nemo Viola, which is a relatively roomy women’s sleeping available in 35F and 20F versions. The Nemo Jazz Double Sleeping Bag. The men’s version of the bag is called the Nemo Forte. The Viola and Forte are basically equivalent to the Nemo Rave and Nemo Disco down bags discussed in more detail in the the next section of this article, except that they use synthetic insulation and are somewhat less expensive. These bags are designed to be somewhat more spacious and comfortable than typical mummy sleeping bags, with zippered “gills” in front that open for ventilation. Like all the other Nemo products that I have tried so far, they felt good to me from a toxicity standpoint. Although I have not had a chance to examine the Nemo Jazz in person, I would guess that it would be similar to the Nemo Viola and Forte in terms of feeling okay from a toxicity standpoint. I have never had a chance to try Wiggy’s sleeping bags, but a few mold avoiders have very positive things to say about them (and also about the company’s sleeping pads). They are somewhat more expensive than most of the other bags discussed in this section. On the other hand, the Teton Sports Celcius bag seems like a bargain, with prices starting at less than $60. Corinne from “My Chemical-Free House” spoke highly of her experiences with this bag, and it gets pretty strongly positive general reviews on Amazon as well. 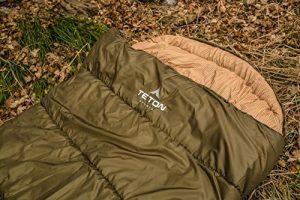 The Teton Sports Celcius Sleeping Bag. 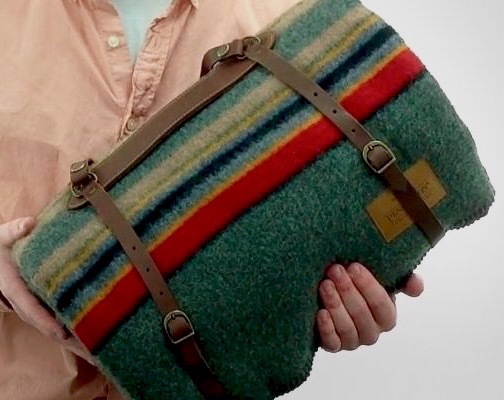 This bag is rectangular in shape and lined with flannel, but unlike the L.L. Bean bag does not seem to entirely unzip so that the bag can be used as a comforter. 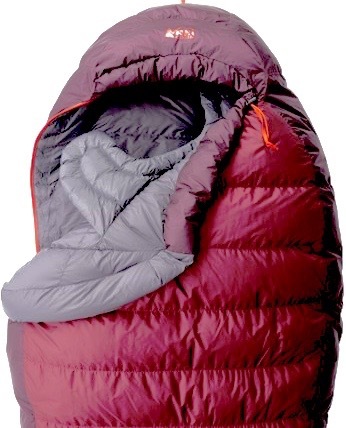 It is a 0 degree sleeping bag, designed specifically for camping in very cold weather. I also have gotten some positive reports from a few mold avoiders about Coleman sleeping bags, which are widely available at reasonable prices through a variety of bricks-and-mortar as well as online retailers. There are, of course, an almost infinite number of other synthetic sleeping bags on the market, and which one is best is largely going to be a matter of personal preference. Some trial and error may be required. A final suggestion is to check into the return policy before purchasing anything online, since it has been my experience that certain especially promising roomy bags not discussed here turned out to be very toxic indeed and had to be returned. Teton Sports Celcius Sleeping Bag. $55. *L.L. Bean Camp Sleeping Bag. $80-109. *REI Co-op Siesta Sleeping Bag 30. $85-100. *L.L. Bean 3-in-1 Burrito Sleeping Bag. $129. Sierra Designs Frontcountry Bed. $150. *Nemo Synthetic Sleeping Bags. $160+. *Sierra Designs Frontcountry Bed 600/SYN 2-Season (Discontinued). $190-210. Sierra Designs Frontcountry Bed Duo. $200. Snow Peak Ofuton Sleeping Bag. $235. Additional REI Co-op Synthetic Sleeping Bags. Additional L.L. Bean Sleeping Bags. Trailful – Sierra Designs Frontcountry Bed. I’ve never previously owned a down sleeping bag, primarily because I always was afraid that the down would get wet and go moldy on me. In addition, I always have been hesitant to spend a lot of money on any piece of gear because I was afraid that it would get cross-contaminated and need to be thrown away. A new innovation, however, is “waterproof down” (or “dry down”) in which the down is coated with a chemical in order to keep it from being negatively affected by water. I have had such good experiences so far with the Ultralight 850 waterproof down jackets and vests that I have purchased from L.L. Bean that I’m a little interested in down sleeping bags now. Nemo Rave and Disco down sleeping bags. 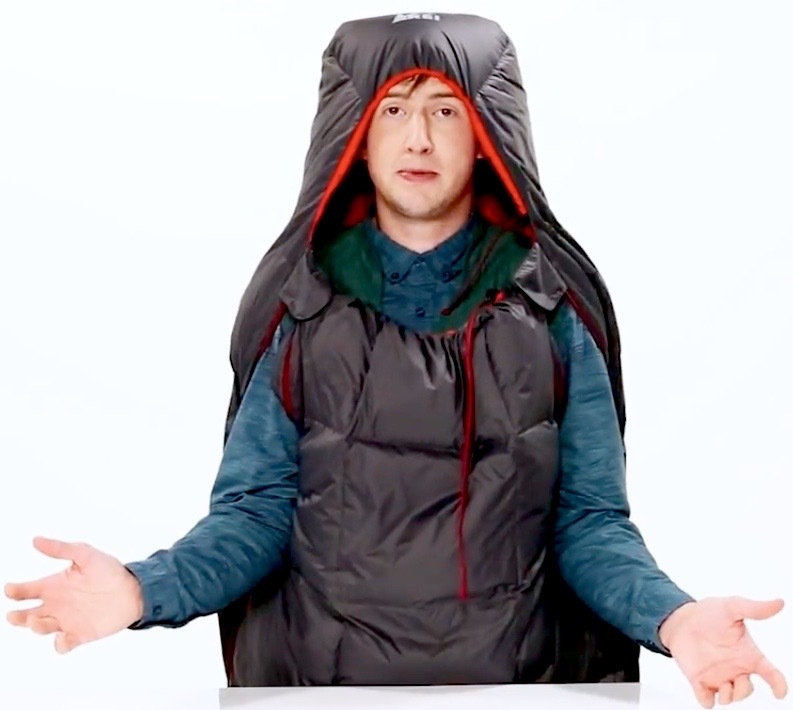 I recently tried out a number of down sleeping bags at REI. The one that I liked by far the most was the Nemo Rave, which is a bag designed for women. The Nemo Rave is a spoon-shaped bag that is meant to provide more room in strategic places than a conventional mummy bag. It also has two long zippers on the front of the bag that – similar to “pit zips” on jackets – allow increased ventilation when necessary in order to prevent overheating. The REI Helio Down 45 Sleeping Bag. I thought that this zipper feature – which I have not seen in other sleeping bags – worked really well and would make a big difference in my comfort level. Both the 15 degree and the 30 degree versions of the Nemo Rave felt great to me from a toxicity standpoint. In general, when compared to all other mummy-type sleeping bags I have encountered, these bags are definitely my favorites. I also felt good about the REI Helio Down 45 and the REI Helio Down 30. These are unisex bags that are designed for flexibility in warmer temperatures. For instance, the footbed opens all the way so that they can be used with feet sticking out the bottom or unzipped fully into a quilt. The Helio bags also convert easily into a sort of hooded down jacket, to be worn for extra warmth while moving around the campsite. And finally, they can be used as a liner or a blanket inside another sleeping bag, to add extra warmth to it. The REI Joule 21 Sleeping Bag. Considering how much I have liked L.L. Bean’s down jackets, I would definitely be interested in looking at the L.L. Bean Mummy-Shaped Down Sleeping Bags if I were looking to buy a mummy-type down bag. I’m sure that the L.L. Bean 15F Ultralight 850 Sleeping Bags would be especially terrific, based on the experiences that I have had with the company’s Ultralight 850 down jackets and vests. However, $450 is a huge amount for anyone to spend on a sleeping bag, and so that one is definitely not going to be in my future. The other L.L. Bean mummy bags have 650-fill down and are somewhat more reasonably priced at $240-330. I’m sure that for those who like mummy-shaped sleeping bags, those are very nice too. However, my feeling is that even the relaxed Nemo Rave was more constricting than would be ideal for me most of the time. If I owned one of any of these mummy bags, probably I usually would just unzip it and then lay it on top of myself like a quilt (with my feet tucked into the little nook at the bottom). I therefore am thinking that for me, a conventional down bag probably is not the right choice and that I might be better off with something else. 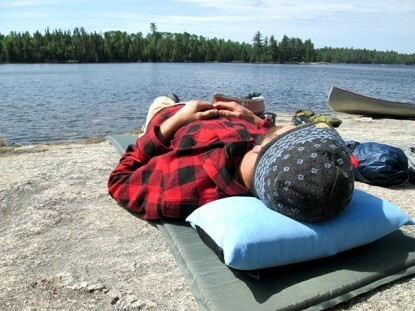 One bag that I have yet to try, though, is the Sierra Designs Backcountry Bed. This bag is very similar to the my Sierra Designs Frontcountry Bed, except that a) it is tapered rather than square toward the bottom, b) it is insulated entirely with waterproof down rather than synthetic material, and c) it is supposedly light enough for backpacking. The Sierra Designs Backcountry Bed. 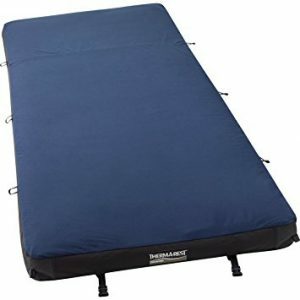 The Backcountry Bed comes in a variety of sizes and weights and seems to be reasonably popular (even though it is no longer sold at REI). Depending on how much I like my Frontcountry Bed, eventually I might consider springing for the more expensive Backcountry Bed as well. A downside to the Frontcountry Bed is that it does not seem that it will work very well as a comforter, and I would guess that this is the case for the Backcountry Bed as well. Feeling very comfortable when lying inside therefore seems especially important with these bags. *REI Helio Down, 30-45F. $139-179. Sierra Designs Backcountry Bed, 600 Fill, 30F. $200-220. Sierra Designs Backcountry Bed, 600 Fill, 30F (Women’s). $200. Sierra Designs Backcountry Bed, 700 Fill, 35F. $250-270. *REI Joule, 30F (Women’s). $269-279. L.L. Bean Down Bags, Mummy Shaped. $239-469. REI Igneo, 700 Fill, 25F (Men’s). $269-329. Sierra Designs Backcountry Bed, 700 Fill, 20F. $290-310. Sierra Designs Backcountry Bed, 700 Fill, 20F (Women’s). $290. *REI Joule, 700 Fill, 21F (Women’s). $299-310. *Nemo Rave, 650 Fill, 15F (Women’s). $300-320. *Nemo Disco, 650 Fill, 15F (Men’s). $300-320. REI Co-Op Down Sleeping Bags. After my visit to the REI store, I realized that although I was not crazy about the idea of sleeping inside a down-filled mummy sleeping bag, I do really like the idea of sleeping with a down-filled comforter on top of me. I think it has the potential of adding a lot of warmth and comfort to a chilly night. That was the main reason that I bought the Sierra Designs Frontcountry Bed – because it had some down in it. And I would be open to the idea of buying an additional down quilt – or rectangular down bag that unzips into a quilt – as well. The Rumpl Down Puffy Blanket. Photo Credit: DoobyBrain.com. While a down quilt does seem to me a bit of a splurge, it nonetheless seems like it could be worth in some cases – especially for those whose sleep diffiulties interfere them from being comfortable in any kind of a sleeping bag. REI did have a few down quilts on display, but they seemed a little too light and also too expensive to meet my needs. L.L. Bean’s rectangular sleeping bags (available in 0F and 20F versions) seem like they possibly may be a decent choice. I have really liked all the down jackets and vests that I have purchased from L.L. Bean, and their down sleeping bags have gotten good reviews in the past. In addition, L.L. Bean occasionally has 25% off sales on everything they sell. That would bring the 20F bag down to a vaguely reasonable price of $180. The Mountain Hard Wear Down Flip Sleeping Bag. 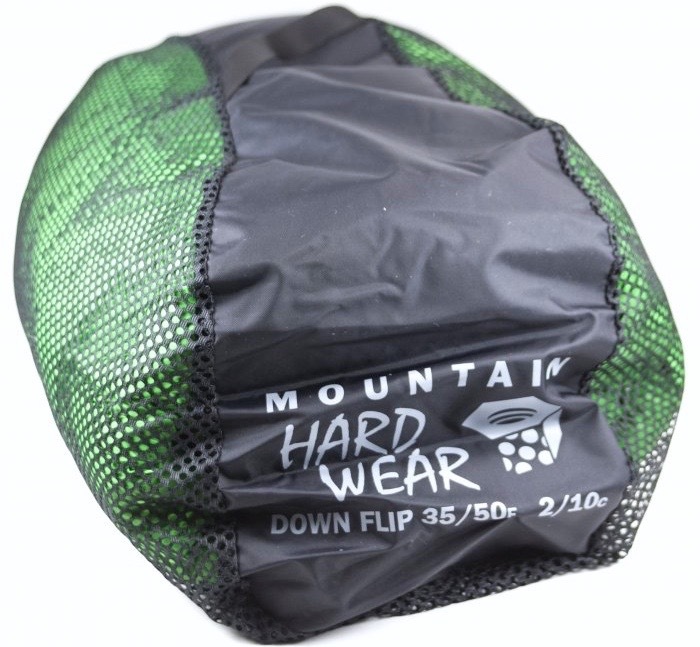 The Mountain Hard Wear Down Flip is a lighter bag (with different amounts of 600-fill down on each side). It seems like it would be good on its own in warmer weather, and that it also could be used as extra insulation inside my Sierra Designs Frontcountry Bed in colder weather. The bag is quite small – less than two pounds and able to fit into a 12″ x 6″ bag. The Sea to Summit Down Traveller is a very light down rectangular sleeping bag (even the larger size is only about a pound) with 750 weight down fill that I might consider if I could find it at a good sale price. 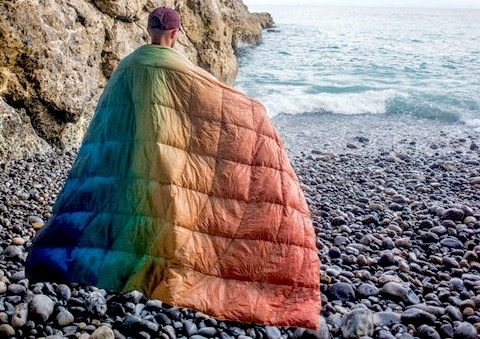 Although these rectangular sleeping bags all can be opened up for use as a quilt-like blanket, most of the down camping blankets specifically designated as “quilts” seem to have special features that make it more likely that the blanket will stay wrapped around the sleeper through the night (rather than being pulled off so that cold air gets in). Considering how much I like the Sierra Designs Frontcountry Bed, the somewhat similarly designed Sierra Designs Backcountry Quilt seems like it might be worth a look, for instance. 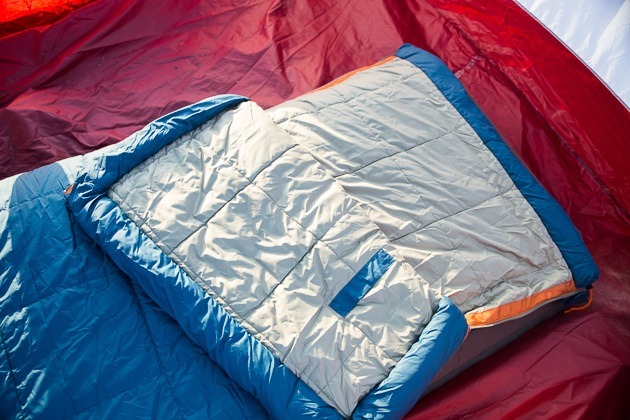 The Sierra Designs 35 Degree Backcountry Quilt. Because I like the way that the Nemo Rave sleeping bags felt to me, I would be interested in the Nemo Siren if it weren’t so very expensive. The ultralight down (850 fill) also is especially appealing, since it should provide a lot of toasty warmth with hardly any weight or bulk at all. Maybe eventually it will go on sale. Finally, I’m a little intrigued by the custom-made down quilts and sleeping bags sold by Enlightened Equipment and would like to hear some reports about them from mold avoiders. They do seem to be getting good marks from online reviewers though. Mountain Hard Wear Down Flip Sleeping Bag. $180. 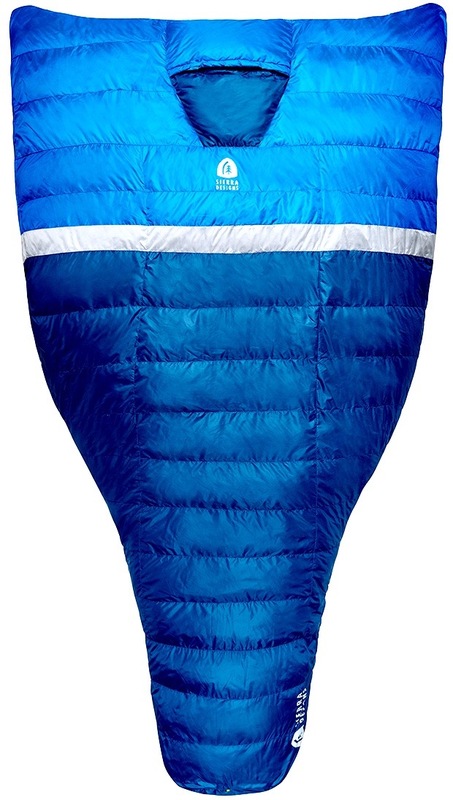 Sea to Summit Down Traveller Sleeping Bag. $210-230. Sierra Designs Backcountry Quilt 700, 35 Degree. $220. Sierra Designs Backcountry Quilt 700, 20 Degree. $250. L.L. Bean Down Bags, Rectangular. $239-329. Therm-A-Rest Corus 35-Degree Down Quilt. $240-250. *Rumpl Down Puffy Blanket, Baja Fade. $250. Enlightened Equipment Down Quilts and Sleeping Bags. $250+. Nemo Siren Down Sleeping Bag. $370. Among the camping items that I have used the most over the years have been fleece sleeping bag liners. I carried around a bunch of them with me (along with some additional fleece blankets) for many years. Most of the time, I slept with just the fleece liner as my sleeping bag. I then added blankets (usually unzipped sleeping bags of various sorts) on top of me as necessary. Only in colder weather (below about 45 degrees) did it seem necessary to get inside a regular sleeping bag with the liner inside. In warmer weather, I unzipped the fleece sleeping bag and used it as a blanket (usually with a second fleece sleeping bag liner as a cover for my sleeping pad). The L.L. Bean Cabin Fleece Sleeping Bag. 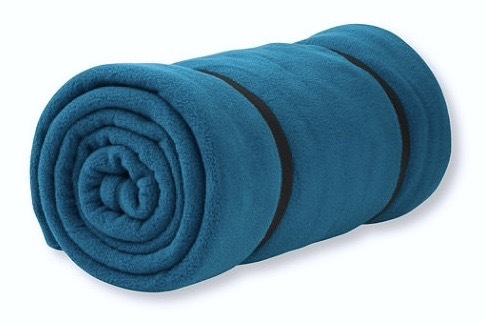 I especially like that fleece sleeping bag liners are extremely easy to wash and dry very quickly. 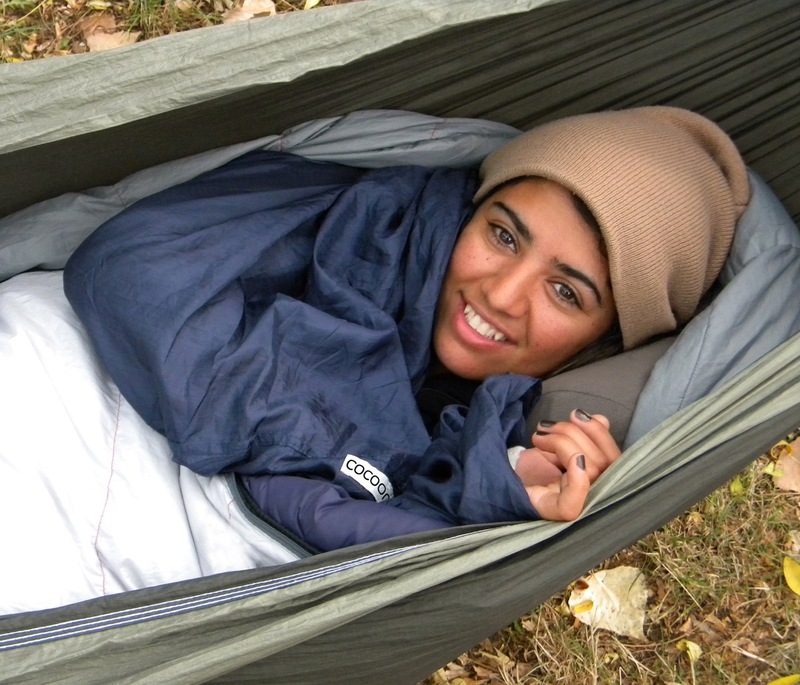 They also feel comfortable to me – cozier and less restrictive than sleeping inside most regular sleeping bags. In addition, they are pretty inexpensive and not too bulky, allowing me to keep plenty of extras around. I recently purchased an L.L. Bean Cabin Fleece bag, and it seems like it should be similar to the many other fleece bags I used in the past. I’ll probably buy a few of the L.L. Bean bags and also look around at other fleece bags as well. On occasion, I have tried other types of sleeping bag liners – including ones made of silk – but never have felt much like using them. The problem is that these other kinds of liners usually do not have zippers on them – meaning that I would have to pull the bag over my feet and then wriggle my body inside it as if it were a big potato sack. That makes getting in and out of bed into a big production and also causes me to feel somewhat vulnerable in terms of my likely ability to defend myself against intruders. A Cocoon sleeping bag liner. Even if I were camping somewhere that was going to be hot and muggy at night, probably I would just get a set of regular twin-sized bed sheets, rather than use one of those sleeping sacks. I don’t understand why none of these non-fleece bag liners have zippers in them. Maybe a good money-making opportunity would be for someone with a sewing machine to go into business putting zippers into them. *Bundle Monster Microfiber Fleece Sleeping Bag Liners. $23. 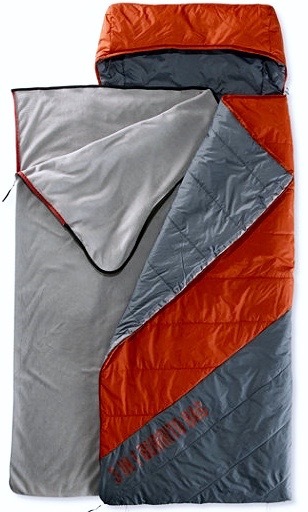 Coleman Stratus Fleece Sleeping Bag Liner. $25. *L.L. Bean Cabin Fleece Sleeping Bag. $40. Sea to Summit Toaster Fleece Thermal Liner. $43. Alps Mountaineering Fleece Bag. $50. Alaska Bear Silk Sleeping Bag Liner. $50. *Cocoon Travel Sheets and Mummy Liners. $20+. *Sea to Summit Sleeping Bag Liners. $43+. A Pendleton Twin Camp Blanket in a blanket carrier. Image Credit: Best Advisor. Recently I have grown to love L.L. Bean Washable Wool Blankets, which are made by Pendleton. I have found them to be comfortable and breathable year round, and washing them occasionally actually makes them feel better to me. I have a couple of them and sleep under them every night. Similar Pendleton blankets are available through a variety of other retailers as well. I am thinking that throwing one or more of these wool blankets over the top of my sleeping bag or other bedding while camping or in my van will give me a great deal of additional comfortable warmth. I also am thinking about experimenting with hanging wool blankets against the walls of my van as insulation against heat as well as cold. I probably will try to find some less expensive wool blankets – like maybe the Wooly Mammoth ones – if I do that though. 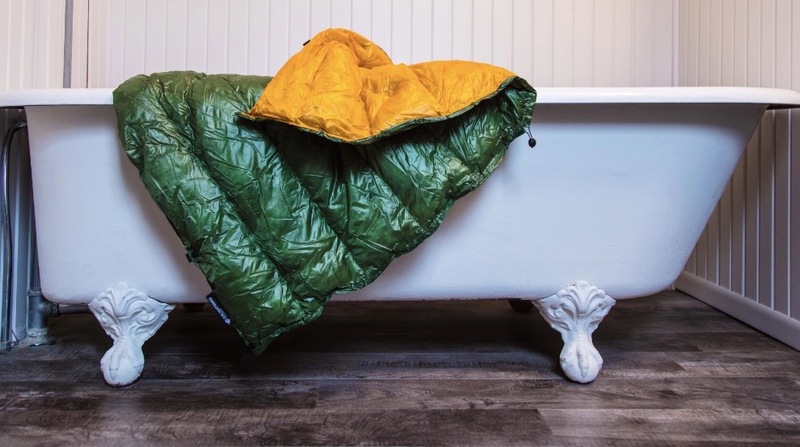 The Nemo Puffin is a high-tech blanket that – similar to a down quilt or sleeping bag – possibly could add some nice extra warmth when stuffed inside my Sierra Designs Frontcountry Bed. There are other similar blankets on the marketplace, but since I liked other Nemo products from a toxicity standpoint, I would be especially interested in trying their blanket out. The Nemo Victory Blanket. Photo Credit: The Wirecutter/Michael Hession. As a blanket to use for sitting on the ground or on the floor of a tent, the Nemo Victory Camping Blanket – which has a waterproof bottom – seems like it might be a good choice. The L.L. 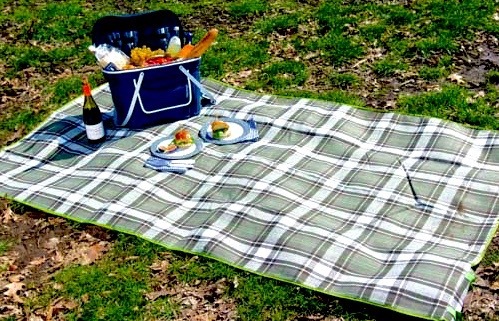 Bean Waterproof Outdoor Blanket comes in a wider selection of colors and seems like it also could be very good for general ground use while camping or picnicking. *L.L. Bean Washable Wool Throws & Blankets (Pendleton). $99+. Pendleton Eco-Wise Washable Wool Blankets. $119+. Pendleton Twin Camp Blanket. $140-169. LL Bean Waterproof Outdoor Blanket. $50-70. Nemo Victory Camping Blanket. $50-80. The Nemo Fillo Pillow. Image Credit: Outdoor Gear Lab. When I was camping full-time, I often just used a fleece blanket folded or rolled up inside a regular-sized pillowcase as a pillow. The pillowcase was easy to wash frequently, and I always had lots of fleece blankets that I wasn’t using around anyway. This solution also was pretty comfortable – much more so than most travel pillows tried. I also used to have a small supply of the compressible pillows made by Therm-A-Rest. Those were a bit on the odd side, as they seemed to contain chunks of foam inside the high-tech cover (giving the whole pillow a sort of lumpy feel). I also once had a couple of them get horribly and permanently cross-contaminated from an outdoor exposure to a toxin at a campground. Still, those pillows were reasonably comfortable and I used them frequently, especially when tent camping. My recent trip to REI suggested that camping pillows have gotten more comfortable but also considerably more expensive over the past few years. 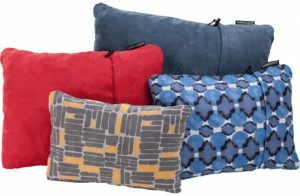 The pillow that I liked the most – the Nemo Fillo Elite Luxury Backpacking Pillow – turned out to cost $55! So I doubt that I will be buying that one unless I can get it at a good price somewhere. I now have a little collection of L.L. Bean down vests in different colors that I bought at a really good sale price. I will try to remember to bring one with me next time I go to REI, to see how well they work as stuffing with the Rumpl Stuffable Fleece Puffy Pillowcase. Pillows, like chairs, are one of those categories where there are a lot of individual differences in personal preference between individuals. It therefore seems like it could be a good idea for those planning to go camping to try visiting an REI store or other camping store to see which options seem to work the best for them. L.L. Bean Flannel Camp Pillow. $30. *Sea to Summit Aeros Inflatable Pillow. $43-47. Rumpl Stuffable Fleece Puffy Pillowcase. $25. 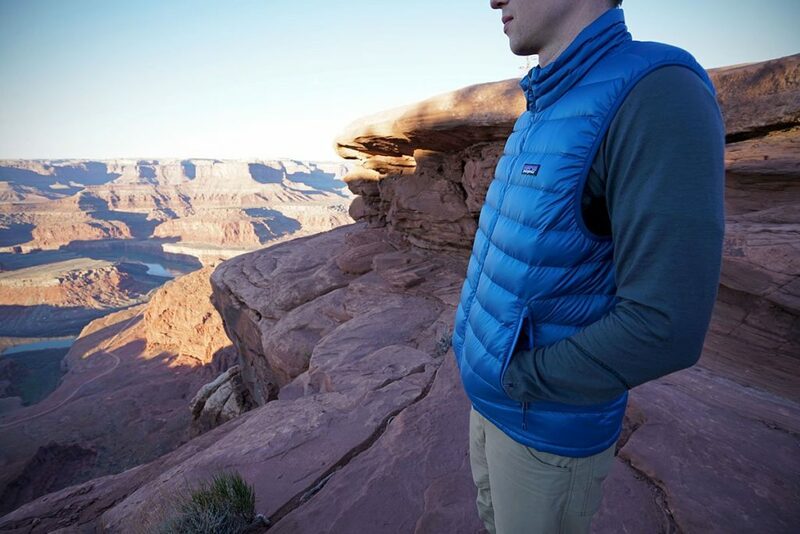 A Patagonia Down Sweater vest. Image Credit: Switchback Travel. The right clothing for camping use tends to be quite different than the sorts of clothes that most people are used to wearing in town. Choosing the right items can make a bit difference in terms of comfort level. Obviously, the exact items of clothing that are used for camping are not going to be the same for everyone. Different clothing works for different people. For instance, I personally have purchased a high percentage of my clothing from L.L. Bean, primarily because they sell a wide range of petite sizes (which of course will not be appropriate for most people). Also, now that they do not have a lifetime guarantee on the products that they sell, I am looking around to see if there are better options out there myself. In addition, most of my clothing purchases have been made when items were on sale at prices of 30-50% off (sometimes even more). That means that even if people were to want to just copy what I have done, most of these clothes will not be available to them anyway since they will have been sold out. However, I still think it may be useful for some people for me to provide a brief description of the kinds of clothing that have worked for me for camping purposes. Therefore, this is just an explanation of the criteria that I have used in choosing clothing that I think is especially appropriate, so that others will have an idea of what to look for in clothing alternatives if they want to follow this approach. The L.L. Bean Katahdin Microfleece Top. For the most part, the casual T-shirt nighties, comfy flannel pajamas and lacy low-cut nightgowns that many people wear to bed at home do not work very well at the campground. For one thing, it always has seemed best to me that women who are camping not distinguish too much in what they are wearing between daytime and sleeping clothes, for the sake of personal safety. It is very likely that people will end up outside of their tent in the middle of the night for some reason or another, whether it be to heed a call of nature or for some other reason, and (at least in my experience) it is much easier to maintain an appropriate sense of distance with others when wearing daytime-type clothes rather than clothes that are obviously for sleeping. It also seems to me best if nightclothes cover the whole body from head to toe and that the nightclothes be easy to wash. The reason for this is because an important goal of wearing sleep clothes is to protect the sleeping bag from getting dirty or cross-contaminated with sweat, since sleeping bags in general are a real pain to wash.
A Baleaf long-sleeved base layer. As a basic sleep “uniform,” I suggest starting out with socks, full-length pants, and a long-sleeved shirt – and then also sleeping inside a fleece sleeping bag liner. On many trips, this will provide plenty of warmth, either on its own or with a heavy unzipped sleeping bag or wool blanket laid over the top as a comforter. In somewhat colder weather, then of course getting inside the sleeping bag (with the the fleece bag used as a liner) will provide additional warmth since it will retain body heat better. An option that may work in many cases, however, is just to add more layers of clothing and then continue to use the heavy sleeping bag as a blanket. This is what I typically have done myself in moderately cool weather (though things may change now that I finally have a bag with some down in it). Adding such items as long underwear (especially soft wool underwear), a fleece jacket, a down vest, a scarf, a pair of gloves and a hat can keep me comfortable at least down into the 40’s, if I have a heavy sleeping bag draped over me. The L.L. Bean Maine Lodge DownTek Hoodie. Of course, if the temperature really starts to drop, then I will wear all of those layers of clothing, plus get inside the sleeping bag liner and sleeping bag. And if things get even colder (like down into the teens or 20’s), then I may drape an additional sleeping bag or wool blanket on top of me, or possibly even resort to wearing a balaclava. On the other hand, sometimes the weather at night is too hot for me to want to sleep even inside the sleeping bag liner. In those cases, I usually will unzip the fleece blanket and use it as a bottom sheet, and then will use a light twin-sized bedsheet (either 100% cotton or a blend) as a top sheet. On those occasions, I may end up wearing just light clothing – such as cotton shorts and a T-shirt – to bed. In that case, while I likely will have to wash the bedding before too long, that is not that big of a deal since fleece blankets and sheets are pretty easy to wash. Although I sometimes do use light cotton sheets or light cotton clothing in the summer heat, otherwise I pretty much avoid cotton for camping in general and especially for sleeping. There is a saying among those who spend a lot of time outdoors that “Cotton Kills,” due to its getting damp with sweat and then drying very slowly – a problem that can lead to hypothermia in really cold weather. I personally have experienced that most impressively when exercising, but it has happened to me with regard to sweating when sleeping in cold weather as well. An L.L. Bean down vest that I purchased on sale for $37. In addition, most cotton is not especially practical for mold avoiders who are on a road trip since it takes a long time to hang dry and takes up more room than most alternatives. Therefore, even though I wear a lot of cotton clothing at home, I mostly avoid it when camping (except for light summer clothing and underpants). For sure, I have avoided cotton sweatshirts, sweatpants, anything made with denim and other similar materials when on the road, due to those things being such a challenge to wash by hand. Lighter cotton pants such as khakis and light knit cotton shirts dry much more quickly, and so I do still wear those on occasion when camping. Still, for most purposes on the road (and especially for exercise), synthetic short-sleeved and long-sleeved shirts tend to work better for me. However, a problem has been that those kinds of clothes usually are labeled as “activewear” and sold at high prices. At $25 or more shirt, the cost of establishing a wardrobe of shirts like this to wear routinely during the day as well as at night can add up really fast. After looking around a bit, I found a few brands that seem to be of pretty good quality and that have worked well for me, but that are more reasonably priced. These have included Baleaf (available through Amazon Prime) and the Champion Vapor line (available at Target and certain other retail outlets). I also have purchased some Fila Sport shirts that I have really liked from my local Kohl’s store. Some of the activewear shirts sold at Walmart (such as those from the Danskin line) may be possibilities as well. For pants, the line of Perfect Fit Pants from L.L. Bean have worked well for me. They are stretchy and comfortable but also reasonably presentable, meaning that I feel okay about wearing them during the day as well as during the evening hours. They also have held up well for me over time, and the fleece version is quite snuggly for colder weather. It seems to me a good idea to wear socks for sleeping when camping even when the weather is not very cold, since it is much easier to wash a pair of socks than it is to wash even a sleeping bag liner (much less a whole sleeping bag). The Outdoor Research Windstopper Peruvian Hat. I want sleeping socks to be ones that I can wear with regular shoes so that I do not have to change my socks when I get up in the morning or if I have to go out at night. I also want my sleeping socks to be a merino blend, because that is comfortable to me in terms of breathability as well as warmth. However, I don’t want or need the same kind of expensive, form-fitting socks that I use for hiking. Socks that are a little slouchier are both more comfortable as well as more affordable for sleeping purposes. For instance, I recently picked up a few pairs of the Terramar Every Day Merino Crew socks (made of a blend of merino and nylon) on sale at a local retailer and then on Amazon for slightly more than $5/pair. I think these will be great for camping (and actually also have been very good just for lounging around the house). If the weather were to turn very cold, I might add a second pair of really heavy wool socks – such as Smartwool Mountaineering socks – over the top of these lighter sleeping socks. Most of the time these socks will be perfectly fine on their own though. For long underwear, I recently have started wearing almost nothing but pure merino wool and have been really enjoying. At first the merino felt a bit itchy to me. However, after I wore the underwear on really cold days on a few occasions, it was like my body started to appreciate the benefits of wearing the wool and therefore to stop objecting to it. I have found that wool is very warm but also quite breathable, meaning that it works well in a variety of temperatures. In addition, wool base layers wash easily and nicely by hand, and they often can be worn a few times between washings before starting to smell or feel bad to me. Icebreaker and Smartwool seem to be the brands of merino underwear that are brought up most frequently. Although I have liked those, I tend to wear them more during the day since they seem to be fairly closely fitted to the body and thus are not entirely comfortable for sleeping. L.L. Bean Wicked Good Pajamas. For sleeping purposes, I like the L.L. Bean Cresta line of merino base layers since they tend to be a bit more relaxed in terms of how they are cut. In addition, the pricing (especially if I can get them on sale) tends to be a little more on the reasonable side. Although the Cresta items have sometimes seemed a little scratchy to me right out of the package, they have softened right up for me after a wash.
Of course, merino may not be tolerated by some people. It also is on the expensive side (though usually easy to find on sale). For those who cannot use merino, synthetics (or a blend of merino with some synthetics) may be considered. The L.L. Bean Heat Keepers line – which supposedly traps body heat – is very popular, for instance. I am personally a bit suspicious of this since it seems to me that it would be impeding breathability, but the products certainly do seem to get positive reviews. Long underwear made of silk is another possibility , and one that is much more durable and easily washable than one might think. If when camping I need more warmth than my long underwear and regular clothing provides, then I usually will add a light fleece jacket or other top. I have purchased a few such tops specifically for sleeping purposes, since I like for them to be lighter and more relaxed than what I might wear during the day so that I can easily move around in them when sleeping. For instance, I recently purchased the L.L. Bean Katahdin Microfleece Top, which is an item that I doubt I ever will wear during the day but that should work well for sleeping in while camping. 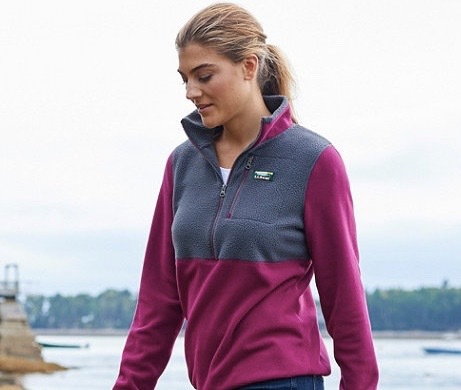 It is fairly loose fitting; has thin fleece on the arms (for movement) and thicker fleece on the body (for warmth); and has a wide open neckline. It also seems like it will be very easy to hand wash and will hand dry very quickly. A down vest is a layer that has the potential of adding significant warmth while allowing the wearer to remain very comfortable in terms of being able to move around freely while sleeping. I never used to buy any down because I was afraid of mold growth, and now am only interested if the down has been treated with waterproofing chemicals (such as DriDown or Down Tek). Although I have had a couple of people express theoretical concerns that the chemicals used to treat the down might be toxic, I have found all the waterproofed down clothing items that I have purchased so far to feel really good really good to me. So far most other mold avoiders seem to be doing well with those types of items as well. Apart from the waterproofing, I think it is good if down vests fit the torso relatively well, since this will allow it to be more comfortable and to retain heat better (and also to be more wearable for other purposes in addition to sleeping). A higher-fill down (such as 800) is lighter, but I have found that vests with a 600-fill rating have been fine too. L.L. 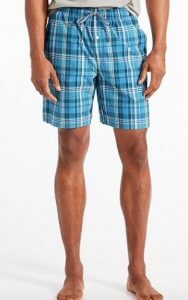 Bean Men’s Madras Pajama Shorts. While down vests often are priced very high, they also often are marked down substantially. Many choices likely will continue to be available most of the time from retailers like REI or L.L. Bean for well under $100, and in some cases much less than that. I bought a couple of nice down vests that should be perfect for camping for $37 each in a recent “Daily Markdown” from L.L. Bean, for instance. The piece of clothing that I am most excited about with regard to camping is the L.L. Bean Maine Lodge DownTek Hoodie. Now unfortunately discontinued, this jacket has a body and a hood containing 850-fill DownTek waterproof down insulation, along with knit merino wool sleeves. The jacket is very warm but also very light. 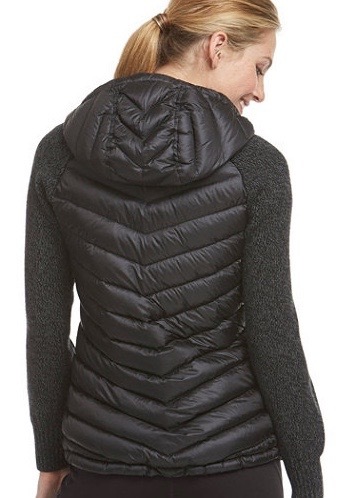 Even more important, the knit sleeves make it totally non-constricting and thus much more comfortable for sleeping than any kind of down jacket, while still providing the benefits of a warm down hood. I am anticipating that it will be great on its own in cold weather and also will work with a down vest over the top for even more warmth. Also I am anticipating that the jacket likely will totally disappear from the L.L. Bean website soon, it may be worthwhile to keep an eye out for other jackets that provide the same sorts of benefits. A hat that I think works especially well for camping is the Outdoor Research Windstopper Peruvian Hat. This hat entirely covers the top of my head and ears for warmth, and attaches under the chin so that it will not come off during the night. However (at least in a size slightly larger than my normal hat size), it is so comfortable that I don’t even remember that I have it on. It works well on its own, or underneath a jacket hood for additional warmth. It also washes nicely by hand and dries very fast. For camping purposes, I suggest loose, lightweight fleece gloves with good breathability (i.e. that are not stated as including any sort of “windstopping” abilities). The L.L. Bean Sweater Fleece Gloves (made of the same material as their Sweater Fleece pullovers) seem like they will work well, for instance. Conceivably ragg wool gloves also could work well for those who feel comfortable with that kind of glove..
A shorter infinity-style scarf – such as the Pistil Frenchi Infinity Scarf – may be especially likely to stay in place and keep the neck warm as the wearer moves around during sleep. The L.L. Bean Women’s Leather Slide. Although I don’t wear a balaclava very often, having one available for really cold nights could be a worthwhile. Although have pretty much only worn daytime clothes for sleeping while camping, conceivably if I had the right pair of pajamas I might switch to those when the weather was warmer (e.g. in the 60’s or above). Again, I would want those pajamas to look at least somewhat like daytime clothes and to be made out of synthetic material or wool rather than cotton. I might consider the L.L. 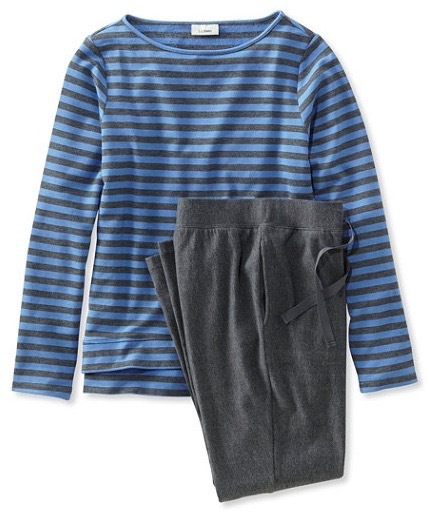 Bean Wicked Soft Pajamas for this purpose if they go on sale, for instance. In very warm weather, I sometimes switch to light cotton T-shirts and light cotton pajama pants or shorts that look like daywear. For instance, the L.L. Bean Women’s Cotton Madras Sleep Pants look like they might be a nice item to try if they go on sale. For shorts, I would prefer a longer pair and so might be inclined to try the L.L. Bean’s Men’s Madras Pajama Shorts, which seem to get pretty good reviews and are not too expensive. I think it is important to avoid dragging dirt from the outdoors into the tent or vehicle and therefore make an effort not to wear outdoor shoes inside. This means that I am frequently having to slip out of my shoes, and often at the same time that I am engaged in an activity that is awkward to begin with, such as crouching down to get into a low tent. Having shoes that slip on and off easily is really important, therefore. I find sturdy leather slides to work particularly well for walking around the campsite as well as slipping easily on and off. Conceivably heavy wool clogs meant for outdoor use – such as those made by Haflinger – also could be a possibility though. Regardless of how well insulated an RV is, the floor is going to get cold in winter. This is especially true of vehicles with metal floors – such as cargo trailers, CampLite trailers and metal vans – but may be the case with other RV’s too. Although heavy wool socks or slippers may be sufficient (especially if an electric or propane heater is being used), very well insulated indoor shoes may be appropriate when the temperature drops. The Baffin Base Camp Slippers in particular seem to get high marks for keeping feet warm without causing them to sweat by many van dwellers. Champion Men’s Vapor Select Training Pant (Men’s). $35. *L.L. Bean Perfect Fit Pants. $40+. *L.L. Bean Perfect Fit Pants, Fleece-Backed. $45. Baleaf Women’s Outdoor Full Zip Fleece Jacket. $46. Baleaf Men’s Outdoor Full Zip Fleece Jacket. $50. L.L. Bean Men’s North Ridge Fleece. $50. *L.L. Bean Women’s Katahdin Microfleece Top. $55. REI Co-op Down Vests. $70. *L.L. Bean Down Vests. $100. *L.L. Bean Heat Keepers Synthetic Long Underwear. $30+. Terramar Thermasilk Long Underwear. $39+. *L.L. Bean Silk Long Underwear. $48. *L.L. Bean Cresta Merino Wool Base Layers. $60+. Smartwool Merino Long Underwear – Bottoms. $75+. *Smartwool Merino Long Underwear – Tops. $80+. 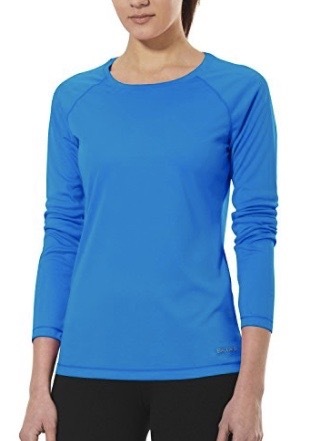 *Icebreaker Oasis Merino Base Layers. $90+. L.L. 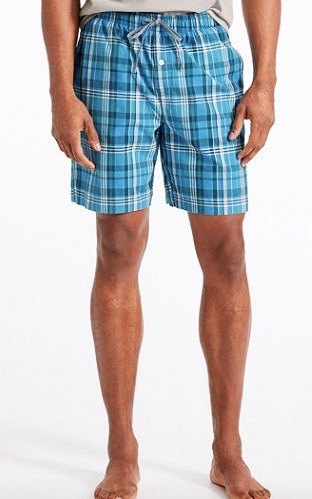 Bean Men’s Madras Pajama Shorts. $30. L.L. Bean Men’s Madras Pajama Pants. $40. L.L. Bean Women’s Cotton Madras Sleep Pants. $40. L.L. Bean Wicked Soft Pajamas. $60. *L.L. Bean Sweater Fleece Gloves (Women’s). $25. 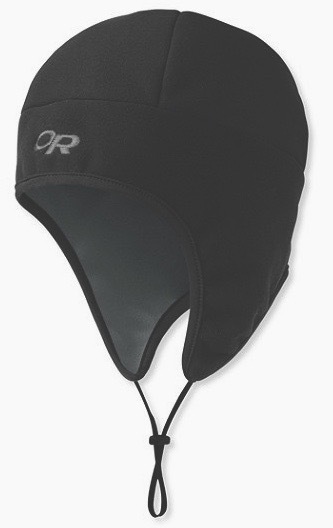 *Outdoor Research Windstopper Peruvian Hat. $34. *Pistil Frenchi Infinity Scarf. $38. *Terramar Every Day Merino Crew Socks (2 pairs). $28. *Smartwool Mountaineering Extra-Heavy Socks. $24. Baffin Base Camp Slippers. $41. L.L. 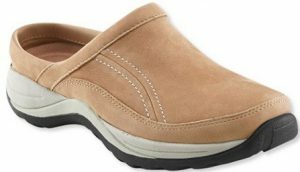 Bean Men’s Comfort Mocs/Leather Slides. $69. *L.L. Bean Women’s Comfort Mocs/Leather Slides. $69. Keen Men’s Houser Down Slide-m Sandal. $75. Switchback Travel – Down Vests. My feeling about daytime clothing is that it’s best for those pursuing mold avoidance to think of their clothes as belonging to three totally separate categories. The first category is what have sometimes been called “civilidevastation clothes.” This is clothing to be worn when traveling to environments that are known to be problematic or that might be problematic from a toxicity standpoint. For instance, this could include moldy buildings, a cross-contaminated car, locations that sometimes or always are problematic, or anywhere else not known to be okay. It’s best to assume when going to these places that all clothing worn is going to have to be washed after the trip. Therefore, assuming that anything that is worn (at least on the outside layer) is going to have to be washed after the trip and therefore choosing things that are going to be fairly easy to wash is really important. In some cases, people find that they need to discard their clothing after it has been exposed to certain environmental toxins. In that case, choosing clothing that is especially inexpensive may be desirable. In many cases, clothing worn into civilidevastation areas needs to look presentable, because that is the time when many interactions with others may occur. Therefore, keeping an eye out for clothes that are easy to wash (or are not too expensive) and that also look reasonably nice may be worthwhile. The main problem here is that typical clothes that are worn during the winter months are generally not designed to be washed very much. In many cases they are either parkas that do not fit very well into washing machines or insulated jackets (such as down) that don’t do well with frequent washing even if it is considered okay to wash them occasionally. And although dry cleaning appears to be of approximately the same effectiveness as regular washing with regard to addressing cross-contamination, getting coats dry cleaned after every wearing is fairly impractical. It therefore may best best to consider dressing in layers in cold weather, with the outside layer especially being something that is super-easy to wash.
As an example, I really like the L.L. Bean Mountain Classic Anorak for this purpose. For one thing, it has a neckline that opens really wide and (in my opinion) looks pretty good when it is oversized, meaning that it can fit over many different items of clothing including some things like insulated jackets. The jacket is made of nylon (so that it can be easily washed) but is not specifically a rain jacket, meaning that it can be worn on sunny days as well as rainy ones without looking out of place. I also like the fact that it is a longer jacket (likely providing plenty of coverage for all the clothes on the top half of the body) and that it has a hood (which may provide some coverage for the hair. It’s available in some solid colors (including black) as well as some sporty patterns, which increases the likelihood of finding the right one to wear on specific occasions. In rainy weather, a loose rain jacket (such as the L.L. Bean Discovery Rain Jacket) or rain poncho (such as this one that I bought from Amazon) could serve to provide even more coverage. Roomy fleece jackets (such as the L.L. Bean Trail Model Fleece Jacket) also are pretty easy to wash and dry quickly. My goal with all of these is to protect clothing that I don’t want to wash very often by keeping it entirely covered when I am in problematic places. Then, when I get home, I can remove the problematic layers and throw them in the wash, and then hopefully be able to put aside the protected layers to be worn again. Although denim and canvas are pretty easy to wash with access to a good washer, if hand washing I would suggest skipping those in favor of other kinds of clothing that is easier to wring out. If cotton is desired, khakis or other thinner cotton pants are much easier to wring out. Most shoes are not designed to be washed at all or to be washed very often. Therefore, one strategy with regard to shoes is to just designate a pair of shoes or a few pairs of shoes to be “civilidevastation” shoes and then to store them in their own plastic bin until it is time to use them again. Personally though, one of the reasons that I have grown to like L.L. Bean Boots (which have rubber lowers and leather uppers) is that the part of the boot that is exposed to various environments can be easily washed. I also feel that they are really comfortable and vaguely fashionable, and also not specifically rain boots, and therefore that I can wear them pretty much all the time (except in the middle of summer or if I have to get especially dressed up). Although I’m sure that there may be some toxins that have the ability to stick to the boots and permanently contaminate them, so far they have been really good for me. A good goal for mold avoiders to work towards is to establish a safe space where they can feel confident that they are not being exposed to cross-contamination. This could be a room in a house, or a whole house, or a good outside location. For those who are camping, it is hoped that the campsite will be a safe space. Or preferably the whole campground. Or maybe even the whole local area. Although clothing worn in the safe space may be relatively free of cross-contamination risk, it eventually will need to be washed, especially if it gets contaminated with sweat. Clothing certainly will also get dirty just as a result of being outdoors, but that may not serve as enough impetus for it to need to be washed in a good environment when camping, if washing is a challenge. What I mostly would suggest for hanging around at the campground is sturdy, protective, comfortable clothing that – unless it’s summer – covers the whole body. Conceivably, clothes like denim or canvas might be appropriate for campsite wear, with the plan of not washing them very often. Something like an L.L. Bean Field Coat – which I would never wear to town because then I would have to wash it – works really well at the campground, for instance. Or I was thinking that this nylon-cotton L.L. Bean Traverse Lightweight Hooded Shirt Jacket – which is made specifically for camping – might be even better, because it would have the same basic functionality as a field jacket, but be easier to wash if need be. Although it’s important to be plenty warm at the campsite, I try to avoid wearing things like down jackets that have the potential of being damaged at the campsite. If I did wear a down jacket, I would want it to be under another item, to protect it from – say – stray tree limbs or campfire smoke. A good pair of flip-flops or other waterproof shoes of some kind are essential for showering as well as possible visits to pools or hot springs. A quick-drying robe of some kind – such as one made of waffle-weave cotton – also can be helpful in getting dry quickly when getting out of the shower or pool. Otherwise, I just suggest dressing as comfortably as possible, in clothes that feel good. *Rain Ponchos Rain Poncho with Zipper. $22. *L.L. 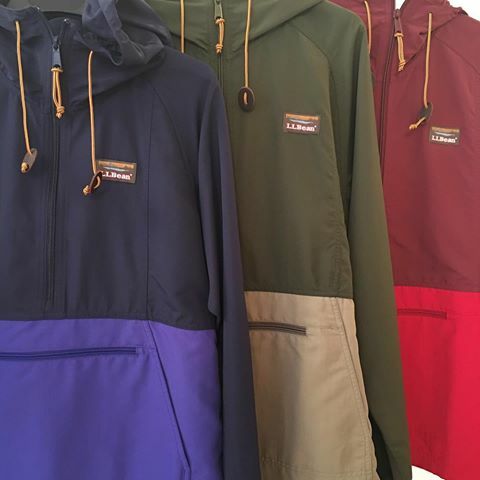 Bean Mountain Classic Anorak. $59. *L.L. Bean Discovery Rain Jacket. $60. *L.L. Bean Water-Resistant Hooded Shirt Jacket. $99. *L.L. Bean Field Coats. $99+. *Adidas Terrex Agravic Alpha Hooded Windbreaker. $158. *L.L. Bean Tek O2 3-Layer Storm Jacket. $199. *L.L. Bean Neoshell Jacket. $349. *L.L. Bean Trail Model Fleece Vest. $45. *L.L. Bean Trail Model Fleece Jacket. $50. *L.L. Bean Sweater Fleece Pullover. $79. *L.L. Bean Primaloft Packaway Jacket. $159. *L.L. Bean Helium Jacket. $169. *L.L. Bean Ultralight 850 Down Vests/Jackets/Coats. $170+. *L.L. Bean Alpha Fuse Jacket. $199. Towel Selections Kimono Waffle Spa Robe. $30. *L.L. Bean Cresta Socks. $14+. *L.L. Bean Boot Socks. $20. *L.L. Bean Mountain Treads Hiking Boots/Shoes. $179+. *L.L. Bean Women’s Bean Boots, 8″ Tumbled-Leather Shearling-Lined. $219. *L.L. Bean Men’s Bean Boots, 10″ Tumbled-Leather Shearling-Lined. $239. More L.L. Bean Women’s Bean Boots. $99+. More L.L. Bean Men’s Bean Boots. $99+. Vertico Slide-On Women’s Shower & Poolside Sandal. $12+. Vertico Slide On Shower & Pool Sandal. $14. Crocs Unisex Crocband Flip Flop. $30.